Winter is approaching in New England as I write these notes. Metrowest Boston has not had snow yet, but it is surely on the way. 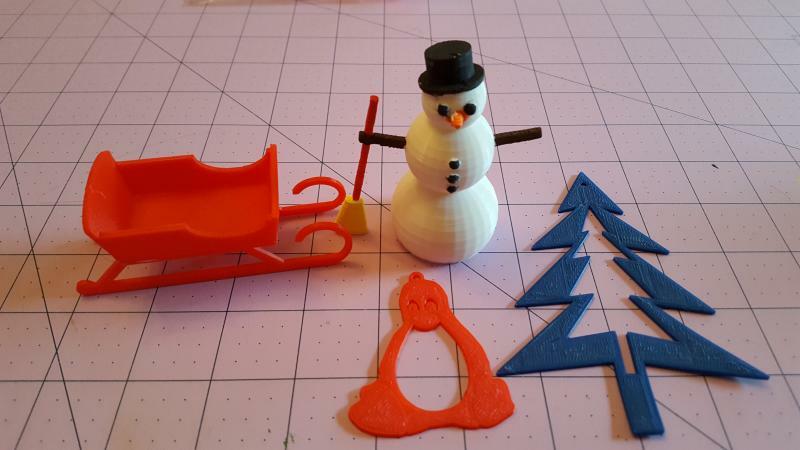 That makes it time to pull together some 3D prints for the season. 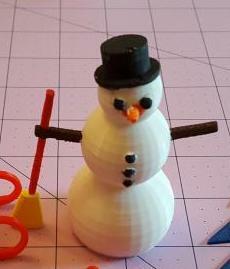 Aside from the little details, a snowman is fairly easy to make. It is really just three spheres for the body, and a few cylinders for the hat, arms and broom. I'll mainly leave it to you to examine the SCAD file to read the notes there, except for one new trick. There's a "normal" view for a new project when you first run it. For small projects, it's pretty good, but in an earlier project, The Sea Captain, I found it necessary to fiddle with the view using the click and drag of both the left and right mouse buttons, along with some zooming out, in order to get a good view of the whole figurine. While designing the snowman, I did that same fiddling, having become used to doing it. But it turns out that it is possible to include view and zoom control commands right in the code so that the figurine (or any project) has a "nice" look as soon as you click the preview or render controls. Setting a "nice" view into the program is a friendly thing to do if you are going to pass the code along to others, or for those projects you did months or years ago and want to revisit. 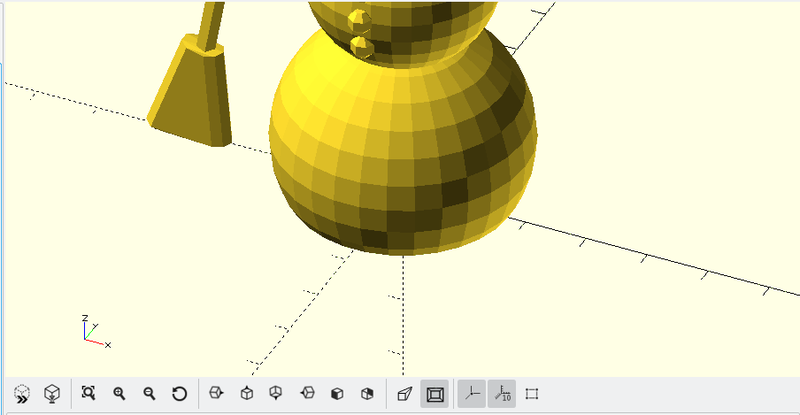 The view values are reported in the status line at the bottom of the OpenSCAD window, so once you have determined your "nice" view, just copy the values you see there into the three variables below. One extra step is involved in making the snowman pop. While the white PLA produces a nice, basic result, the hat "needs" to be black. So do the coal buttons and eyes. Acrylic paints come to the rescue. 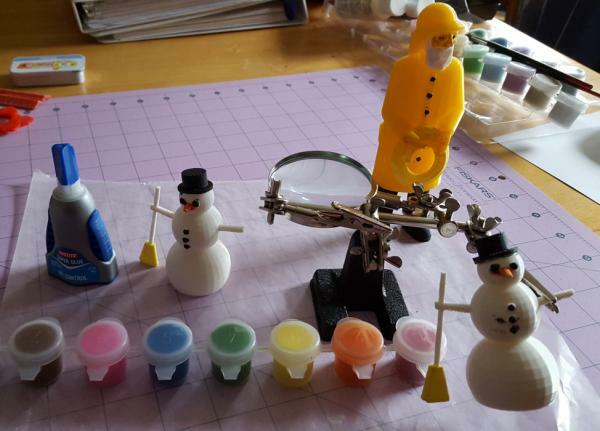 Acrylic sticks nicely to the PLA and part of my "plan" is to make a gift of a set of these seasonal prints to each of my grandchildren with a basic set of paints and brushes. I'm expecting that the youngest will produce the most interesting result with perhaps a purple base, green belly, yellow head and polka-dot hat; but we'll see! 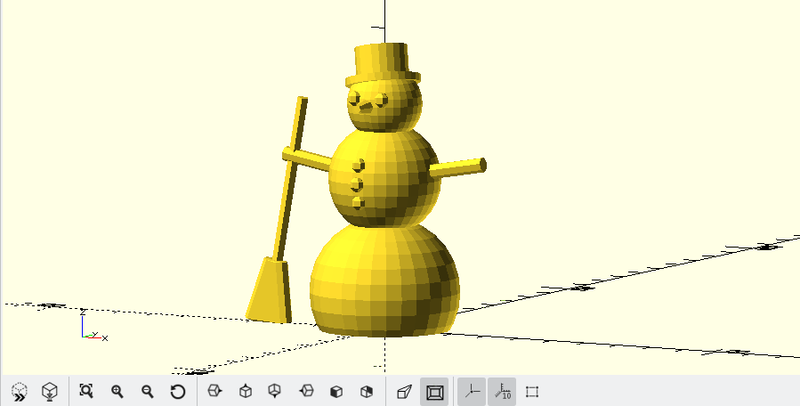 The season demands more than just one 3D project to print, after all, so there will need to be several of these web pages over the next weeks. Stay tuned.